Former Exeter Mayor Robyn Stearns announced her candidacy for Tulare County Board of Supervisors District 1 at a campaign launch party Friday evening. Stearns will face challenger Larry Micari and incumbent Tulare County Supervisor Kuyler Crocker. Approximately 50 of Stearns close family, friends and co-workers gathered to launch her campaign. Ted Macauley, also a former Exeter Mayor, introduced Stearns, expressing his support for her campaign and how much he enjoyed working with her on the city council. Macauley is also supporting Micari for supervisor and plans to donate to both campaigns. 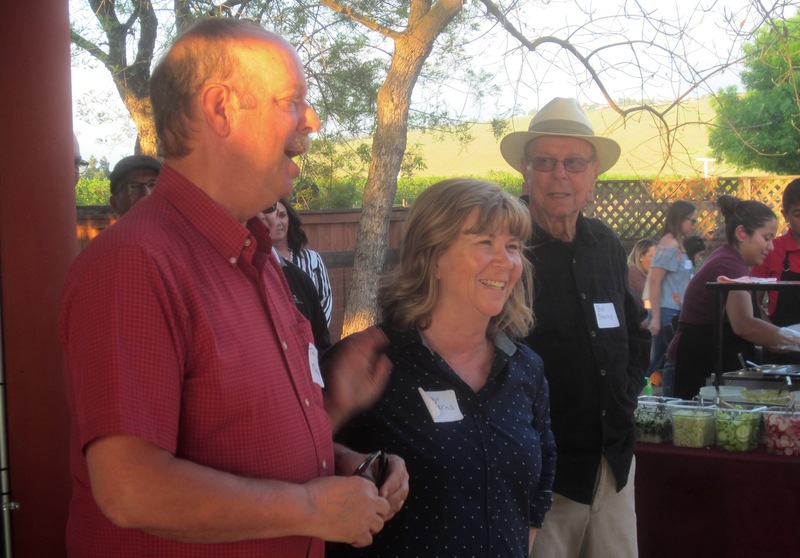 Several attendees at the event expressed their belief that Micari and Stearns will be the top two vote getters in the March primary, leaving current District 1 Supervisor Crocker behind. Crocker has held the District 1 supervisor seat since his narrow victory against Dennis Smith in 2016. Stearns kept her comments short as all in attendance knew her well. “I will do a great job as supervisor, of that I am sure,” she said. Stearns has lived in Exeter since a toddler attending its school system kindergarten through high school. She opened the Wild Flower Café in 1991 and then got her real estate license in 2002, working for Heaton Properties. In 2008 she won a seat on the Exeter City Council and served for eight years, four of those being mayor. Visalia City Council Member Brian Poochigian was at the launch party and has officially endorsed Stearns. Stearns has in fact met with all of the Visalia City Council members in preparation of her run. “Every area has its own issues and I have been meeting with decision makers to prepare for my run.” There is much camaraderie between the two city councils, she said, and each Visalia city council member was very supportive of her campaign. In her initial meeting with her campaign team they discussed walking the areas of district 1 where she isn’t as well known. East Visalia has approximately 15,000 voters and she intends on pounding the pavement in that area to get to know the residents and their issues. She said the community of Exeter already knows her but the town is just a small part of the district. Also, with her family being involved in citrus farming since 1961, she has name recognition among the east side farmers that stretches from Exeter to Strathmore. “Life skills are huge. Because of what I have done in life as a mom, grandmother, and business owner prepares me for the job as supervisor,” she said. Stearns is not exactly excited about the campaigning side of reaching her goal to be District 1 supervisor, but sees it as a necessary evil. I wonder how she accounts for the police department she presided over not being able to identify one of their own as California’s most notorious serial killer for over forty years? @ Wondering. When he lived in Exeter she was in High School. So a mischaracterization of the term “her police department”. He had lived in Sacto area for the past 40+ years. I think that more than what Robyn has learned as a mother and grandmother, her two terms as City Councilwoman and term as Mayor of Exeter have given her experience in the area of local government like no other candidate/incumbent has. And Robyn is a go-getter. It’s really because of her that the wonderful project along Belmont Avenue south of Visalia Road exists. When confronted with something that needs to be fixed, she jumps in, studies, talks to people, and makes a decision about whether it’s a worthy project. If so, she gets it done. I fully support Robyn! Actually, the comment demonstrates how little we get from any and all county supervisors. When have we heard from do nothing Shucklian since her election? They are all highly paid worthless trash! And talk about political corruption. What does somebody want from the BOS when he is willing to contribute to two opposing contenders?